THANK YOUR FOR A NIGHT to REMEMBER! 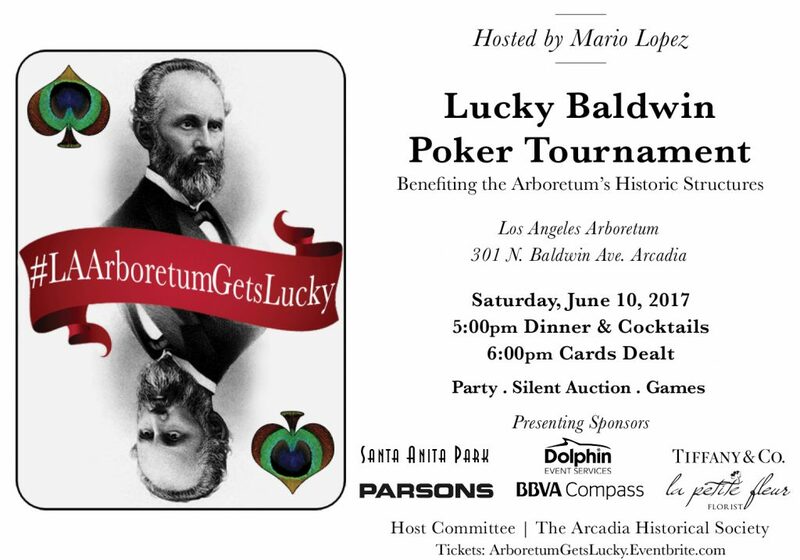 Thank you to everyone who supported the Los Angeles Arboretum Foundation’s Lucky Baldwin Poker Tournament on June 10, 2017. Set under the starry night sky on the lawn of the Queen Anne Cottage, the festivities included cocktails, dinner, games, auction, entertainment and poker tournament. There were Tiffany & Co. gift bags for guests. The fun filled evening raised funds for the restoration and preservation of the Arboretum’s historic structures (Queen Anne Cottage, Coach Barn, Reid-Baldwin Adobe and Santa Anita Depot) dating from 1840 to 1890. Mario Lopez, from EXTRA TV, hosted the evening. The tournament’s organizers are grateful for the support of patrons, preservationists, and civic activists in our community who helped make the tournament a successful benefit! Elias Jackson “Lucky” Baldwin (1828-1909) commissioned outstanding examples of late 19th century architecture for his home and ranch of some 50,000 acres, established in 1875. Baldwin Ranch was among the great agricultural enterprises of the period, and reflects his important role in the development of Southern California. The heart of the Baldwin Ranch is today part of the Arboretum. Baldwin’s great legacy consist of four landmark buildings: The Queen Anne Cottage (1885), a magnificent Victorian-style structure well-known as a location for movies and television; Coach Barn (1879), a finely crafted show barn that likely displayed Baldwin’s finest racehorses; Reid-Baldwin Adobe (ca. mid-1800s) originally a structure built by noted pioneer Hugo Reid, and later Baldwin’s home; Train Depot (1890) constructed for Baldwin by the Atchison, Topeka & Santa Fe Transcontinental Railroad. The Poker Tournament will fund preservation measures developed by skilled architects specializing in historic preservation. The 127-acre Arboretum, founded in 1948, serves over 380,000 annual visitors from Southern California and around the world. Visitors explore spectacular period architecture, as well as Victorian rose and herb gardens, and biogeographic displays representing the floras of Africa, Australia, South America and the Mediterranean Basin. Extensive tours and education programs serve over 20,000 students a year. The Los Angeles Arboretum Foundation co-manages and operates the Arboretum in partnership with L.A. County. The Foundation, a 501 (c) (3) organization, provides gardens and programs serving Southern California, and leads the community in enhancing the Arboretum as a premier public resource.